In certain developing nations, landmines are a terrible scourge that cause countless deaths and injuries. 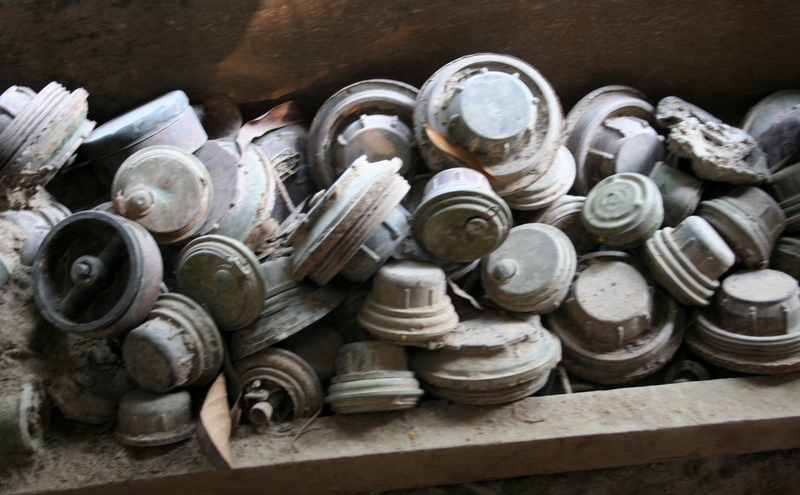 In most cases, the landmines are forgotten relics, the leftover remnants of civil wars, terrorist campaigns and national liberation efforts. Have been buried in unmarked areas and forgotten, many of the victims that come across these little packages of death do so entirely by accident. Over the past century, the situation has become such that a ban was placed on their sale and in 1997 – officially known as the Anti-Personnel Mine Ban Convention or Ottawa Treaty (my old hometown, where the treaty was signed). 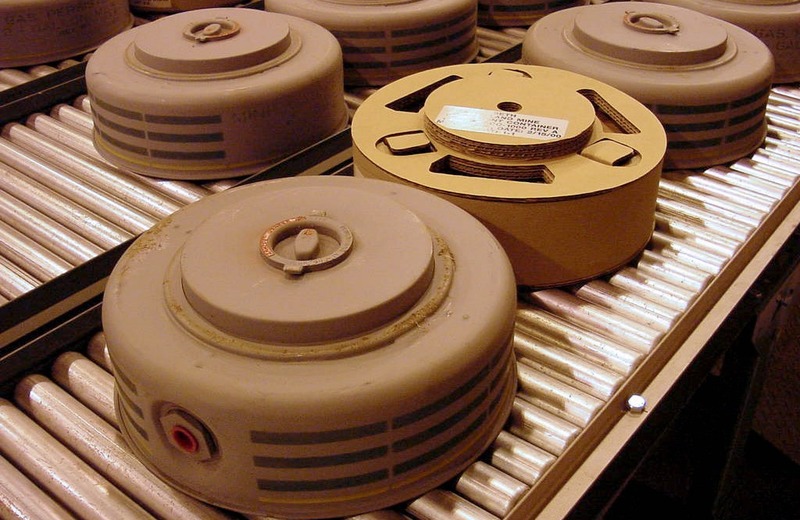 However, banning the manufacture and sale of the devices addresses the problem at only one end, and does not address the many thousands of mines that have to be found and disposed of. In Colombia, for instance, some 10,000 have been maimed by anti-personnel devices since 1990, putting the country second only to Afghanistan in the total number of deaths and injuries associated with landmines. This is due to Colombia’s long guerrilla war, where groups like the Revolutionary Armed Forces of Colombia (FARC) have used mines to protect their bases and drug plantations. The only real solution, of course, is to clear the mines and destroy them – a process that is now under way. In the meantime, however, people are still exposed to danger, and there’s a need for technology that helps people walk through rural areas without constant fear. 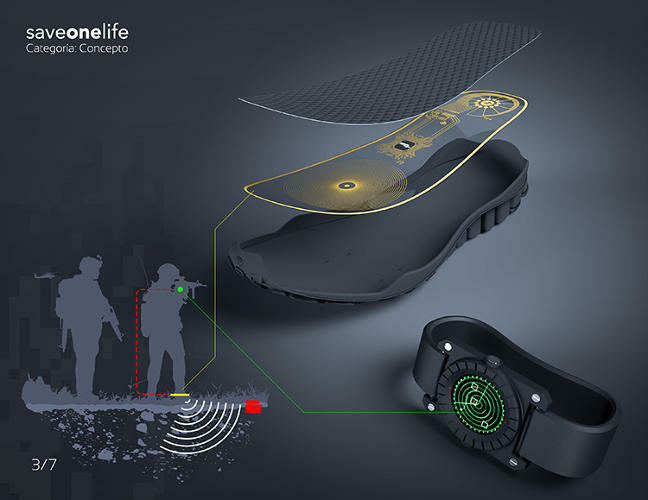 Enter the SaveOneLife, a wearable landmine detector you slip into your shoe that may save your life. Designed by Lemur Studio, a design firm in Bogotá, the detector alerts the wearer if an explosive device is within a few feet of their path. It’s aimed at troops, people eradicating illicit crops (i.e. coca leaves and poppies), and farmers, all people who have to deal with landmines on a regular basis. Currently in the conceptual phase, the studio is looking for funding and support to get it built. The detector consists of a coil printed on a thin conductive material that produces an electromagnetic field. This field in turn detects other electromagnetic fields that are emitted by large pieces metal nearby. 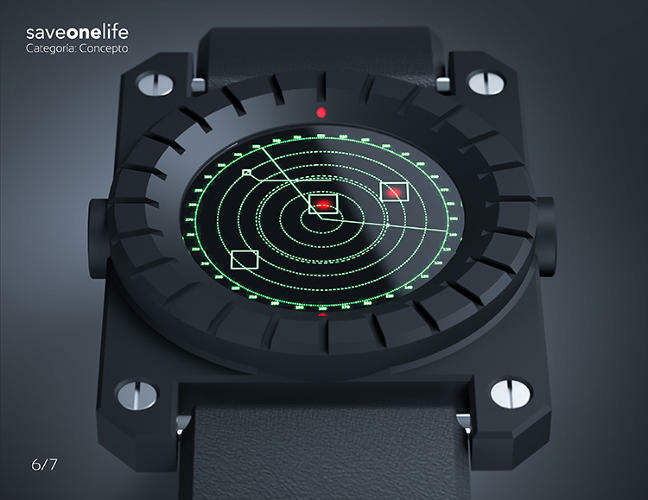 If it finds a mine within the wearer’s proximity, the device sends a signal to a wristband, telling the wearer to watch out or change direction. The device was created with the goal of saving a life, hence the name, first by the families of the victims and second for the cost effects of military forces by the loss of his men in combat. We would like many people to benefit from it, not just people in the armed forces but also peasants and workers. We hope that some company or government wants to give us the support we need to complete the project and bring it to reality. The idea has been nominated for several design prizes. And if funded, is likely to be adopted for use by NGOs, medics, engineers, civilians and military forces worldwide. But even if Pérez and his studio are not endorsed by the Colombian government (which is unlikely given the problem of landmines), an international crowdfunding campaign is likely to succeed. 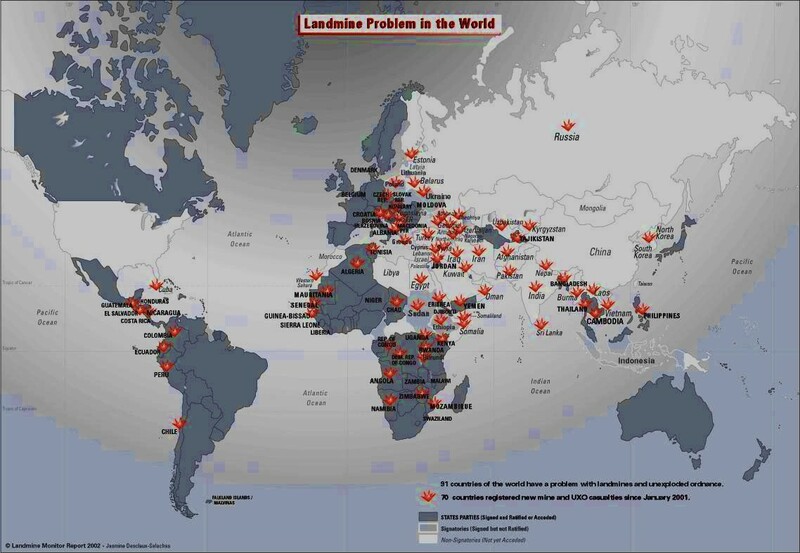 After all, the problem of landmines is one that cuts across nations, organizations, and people of all walks of life, and a device that helps deal with this problem is likely to draw a lot of attention and interest. Being able to tackle the problem of forgotten ordinance and hidden dangers at the other end of the things will be a big step in helping to eliminating this dangerous legacy. That is an awesome idea. It would save so many lives. This is so cool! Stuff like this gets me so excited about advances in technology. Minefields are a huge problem in Cambodia. When I was there we were repeatedly warned to stay on major walking paths and roads at all times because you never know what a random field could contain. And it was so sad to see people who had been maimed by accidentally walking through minefields. So glad that this detection system will be out there and saving lives! Of course you were there, you are so well traveled aren’t you? Was this for work or for pleasure? Travel is always a pleasure! Although most of my travel involves quite a bit of work too. 🙂 I was with a non profit for a 5 month stint just after high school. We spent 2 months working in slums, refugee camps, with human trafficking victims, and near hill tribes in Cambodia, Thailand, and Laos. And my jealousy continues to mount… I spent the summer after high school (which was right down the road from me) painting and doing construction work, then went straight to a University just a few blocks away. BORING! It’s never too late to travel though! And I know you have some travel plans ahead, you always go to gorgeous spots. 🙂 Any upcoming adventures for this year? I guess “after high school” isn’t the most accurate. I graduated high school a year early and knocked out my Associate of Arts while working full time for two years in Alaska, then Asia. That’s the only way I could pay for school and save for travel at the same time. Totally worth it but definitely a lot of work. Oh yes! The wife and I will be joining my folks and going to Europe this April for the centennial anniversary of World War I. From Paris, to Ypres, to Dieppe, Bayeaux and Chartres, then back to Paris. Flander’s Field and Normandy, all in one shot, taking in memorials and the battlefields that have permanently marked the landscape, and delving into the local culture on the way. Oh, but now I’ve been bit by the green eyed monster. That sounds freaking amazing and it’s right around the corner!! Please promise you will post tons of stories and photos from the trip! Wow, so so excited for you!